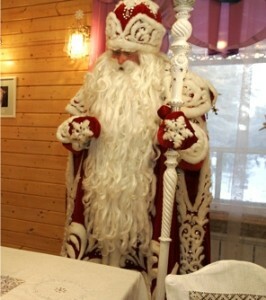 He is the Russian version of Santa Claus. Sometimes he is called Father Frost or Grandfather Frost and is associated with the new year, celebrated on January 7. 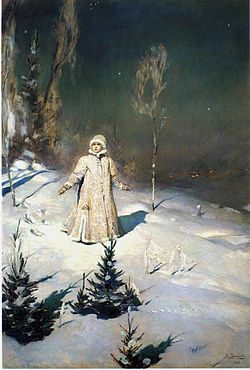 She is his granddaughter, sometimes called the Snow Maiden. She accompanies him on his journey and entertains children and gives them gifts. Some sources indicate that another woman, Babushka, or grandmother, hands out gifts also. Their robes are fur-lined, usually blue, but many photos show them in red. In 1935 Josef Stalin’s two children returned from a Christmas celebration given by the British Ambassador in Moscow. It delighted him to see his son and daughter so happy and excited. This gave him an idea. He wanted to translate the joy into the people of Russia (and boost his popularity). Christmas was not an option in an atheist regime, so he declared that the country’s economic progress would be celebrated at the turn of the year. All families were to have a live New Year’s tree in their homes celebrating the Soviet Union. What’s more, Ded Moroz and Snegurochka would bring gifts to all. Lt. Raisa Tarasova in Night Witch, and Lily in my new book project, celebrated the new year of 1942 quietly with their fellow pilots, exchanging small hand-made gifts, drinking a ration of vodka and singing. They longed to be with their families and friends, particularly on this special holiday. But,they were soldiers of the air, living near the frontlines, waiting in the cold for the opportunity to strike the enemy. They had a job to do. War had made them hard and strong, but had not taken their love and fervent desire for peace and a hope-filled future in the year to come. Thank you for your interest in my stories and for visiting my website. I wish you a joyous Christmas and a happy, healthy new year.